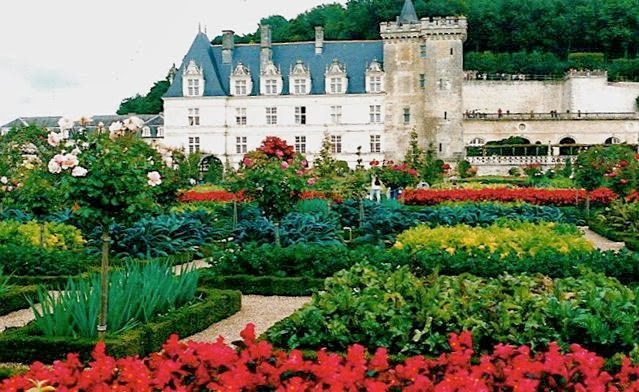 A few years ago, I had the pleasure of visiting the gardens at the Chateau Villandry in the Loire Valley of France. The gardens there are gorgeous. Of all of them, though, the kitchen garden is the one that made the biggest impression on me. My memory of that visit has forever changed what comes to mind when I hear the phrase, "kitchen garden." I've grown vegetables and I know that "working" gardens, the ones that produce our food, aren't always picture perfect. They start out in spring looking orderly, but as the season progresses and gardeners get bored or busy with other things, the garden begins to go a bit wild. Vines wander, weeds creep in, lettuce bolts, and yellow leaves tattle on gardeners who water too much or too little. 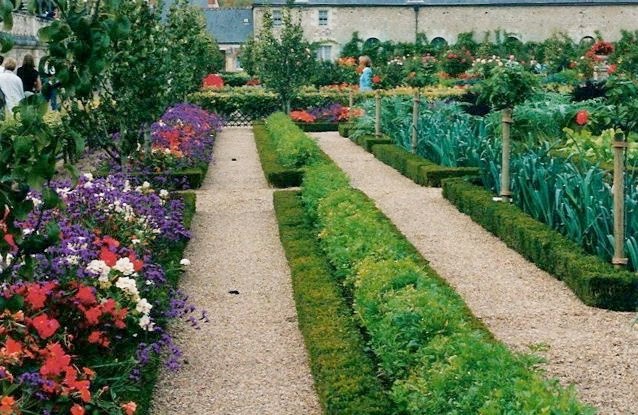 Before my visit to Villandry, I thought of gardens as being either ornamental, planted and arranged to bring beauty into a space, or edible, planted for the purpose of food production. Never the twain to meet. But leave it to the French, with their love of all things beautiful and delicious, to combine the two. I was there in September, the time of year when vegetable gardens often look their worst. But here, with beds edged with boxwood, flowers and espalliered apple trees, the garden looks tidy and thriving. 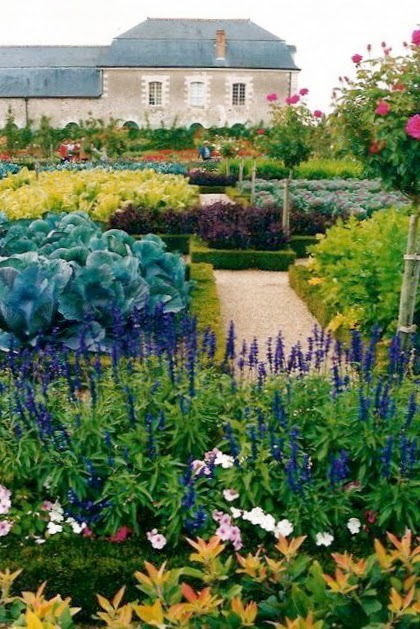 Villandry's kitchen garden is all organic. Gardeners use non-chemical techniques both old and new to maintain the health of the soil and plant material. It's all here: cabbages, kale, beans, various greens, leeks, berries, dwarf fruit trees and more. I saw pumpkins and squash being harvested when I was there. Rose standards mark the corners of beds. Annuals and perennials provide cutting flowers and seasonal color. Where does all this bounty go? The chateau restaurant, La Doulce Terrasse, offers a seasonal menu featuring produce from the garden and the local area. If you would like to visit Villandry and enjoy its gardens, information is available on their official website. Even if you can't visit in person, you'll want to take a look to find inspiration for your own kitchen garden. Bon appetit!